The book is HYSTERICAL, okay, I need to slow it down, don’t want to oversell, but seriously, there were parts that caused me to snort laugh. Out Loud. On Public Transportation. Chip Zdarsky’s writing is quick and witty, and quickly proves that although he is our lead, Howard is definitely the underdog here. The mostly unliked underdog. He’s sarcastic, and maybe not the brightest or most moral of heroes, but he completely owns up to it and makes it work for him. 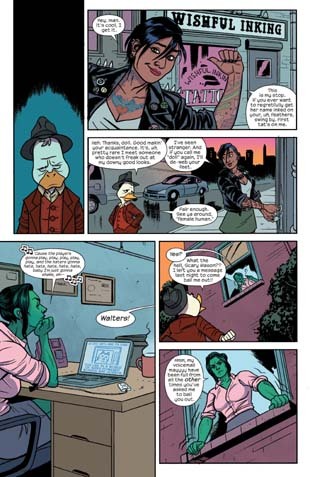 Throw in an adorable inked up “side kick” and a SLEW of Marvel cameos, She-Hulk, Spider-Man and Rocket Racoon to name a few, and it is just one fantastical journey. Totally worth picking up. I can’t wait to see Issue #2 out on April 1st. This entry was posted in Book Review, Comics and tagged Comic Books, Comics, Guardians of the Galaxy, Howard the Duck, Marvel, Marvel Cinematic Universe, Reviews, Rocket Raccoon, She-Hulk, Spiderman. Bookmark the permalink.